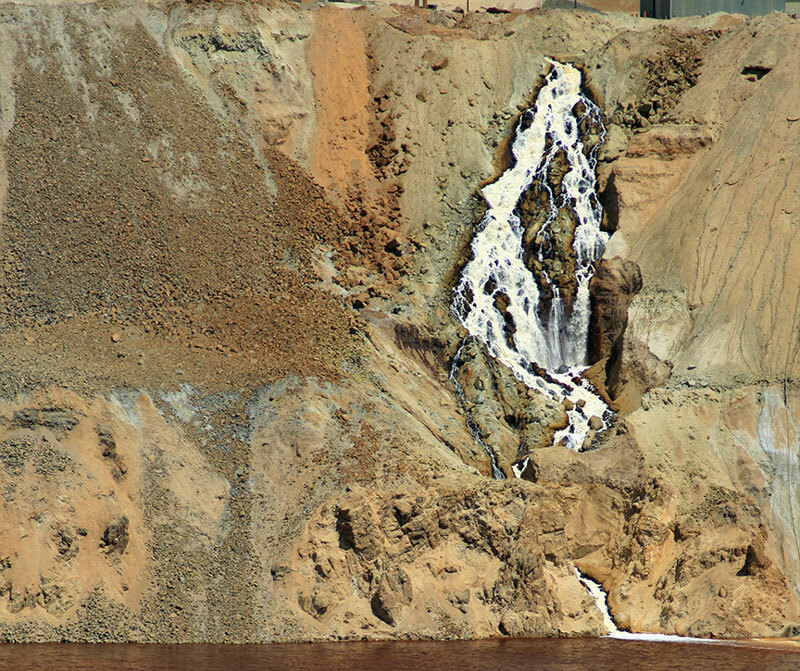 The Berkeley Pit, Continental Fault, and the two wells that showed water level changes after a July 2005 earthquake. 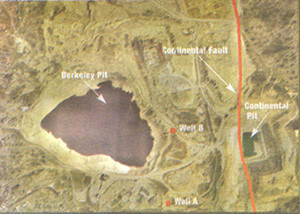 A 5.6 magnitude earthquake centered near Dillon on July 25, 2005 did not affect the Berkeley Pit. There was no Pit wall sloughing or change in the water levels in the Berkeley Pit, the underground mine shafts, the alluvial aquifer wells, or the majority of the bedrock monitoring wells. However, two bedrock monitoring wells (A&B) showed changes. Well A showed an initial water level decline of about one (1) foot after the earthquake, and the level stayed lower for a number of days before rising again. Well B, which is located in an area that wasn’t dewatered as extensively by historic mining activities as other portions of the bedrock aquifer had a 9-foot drop in water levels in the month following the earthquake. Recently, the water elevation in Well B is rising again. One possible explanation for the lower water level in these wells is that the earthquake opened up existing fractures in the bedrock surrounding the wells. Water then flowed into these fractures until the bedrock adjacent to them became saturated. When that happened, the water levels began to rise again. Since the July earthquake, there have been two additional quakes in the region, one of which was centered in the Butte Basin. Both of these other quakes were considerably smaller in magnitude, and no effects were noted in the Berkeley Pit or bedrock monitoring wells.